Image and graphics designed and created using Adobe Photoshop and Illustrator. 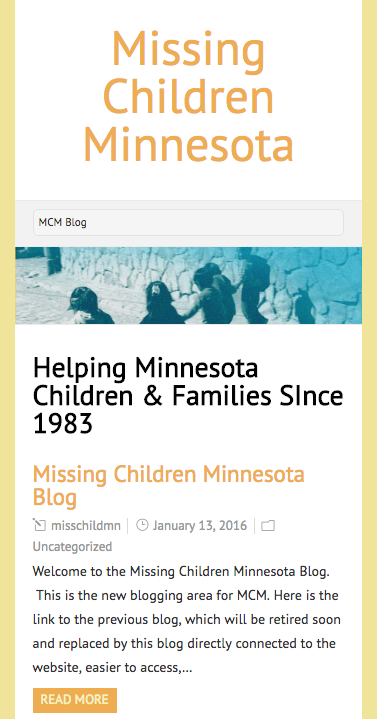 Website created with the CMS Wordpress. 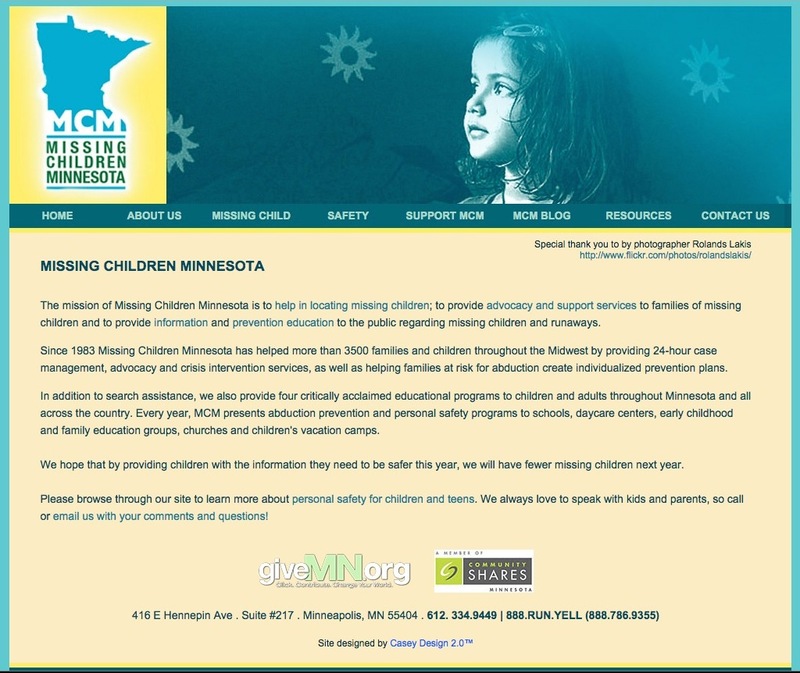 I created the first website for Minnesota Missing Children in 2012. I was also their graphic designer and created their logo/visual identity and brand style guide. 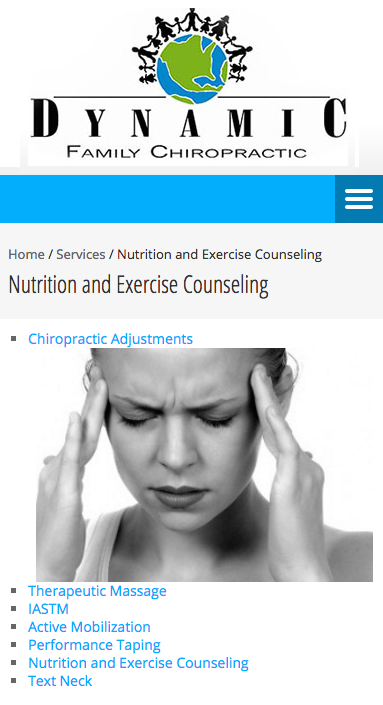 I created their new website in 2015 to make it responsive. 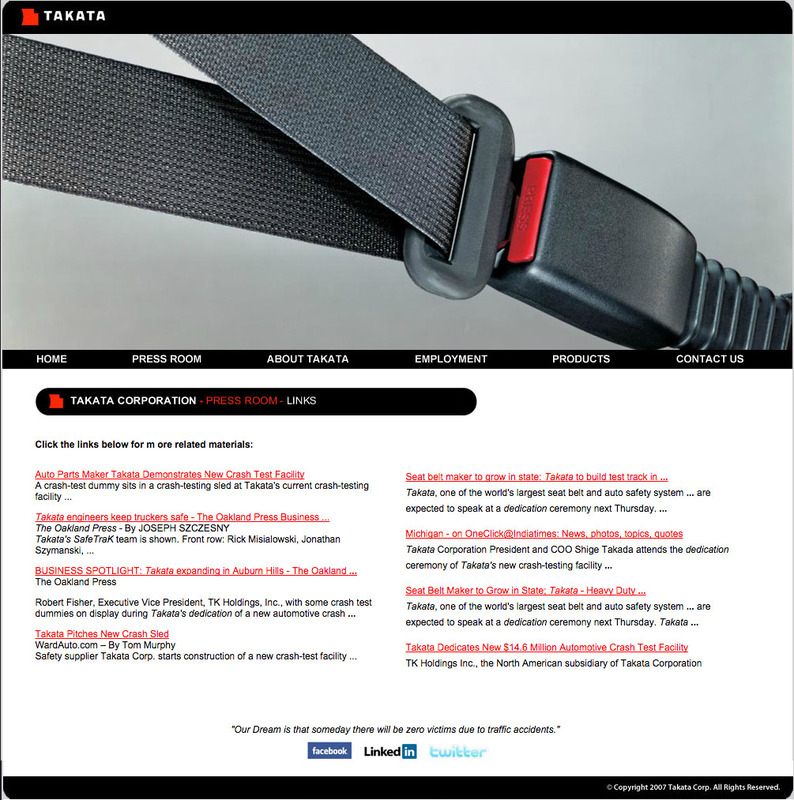 It now adapts to users various web access devices such as smartphone, tablet or computer. 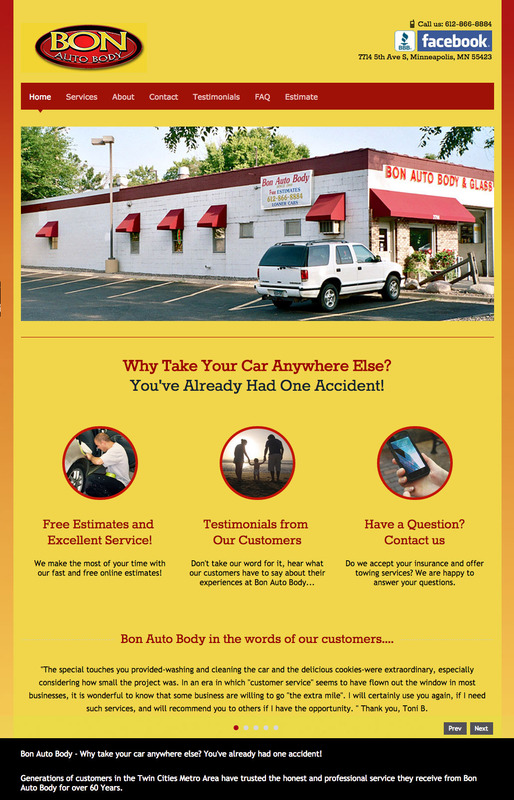 Website design for Bon Auto Body, Richfield, Minnesota. We emphasized bright, dazzling color in the website design to highlight the "teaser" focusing on Bon Auto's extremely accurate color matching system for flawless "paint after repair" color matching. 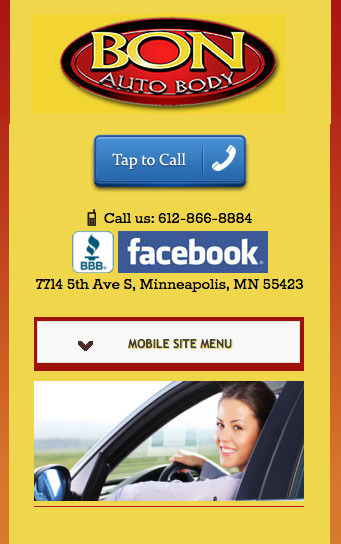 Auto body service is extremely competitive in the Twin Cities and it was time for a new website. We recreated the existing site in a responsive design, that adapted to the site visitor's device. Image effects and graphics designed and created using Adobe Photoshop and Illustrator. Website created with the Wordpress CMS. 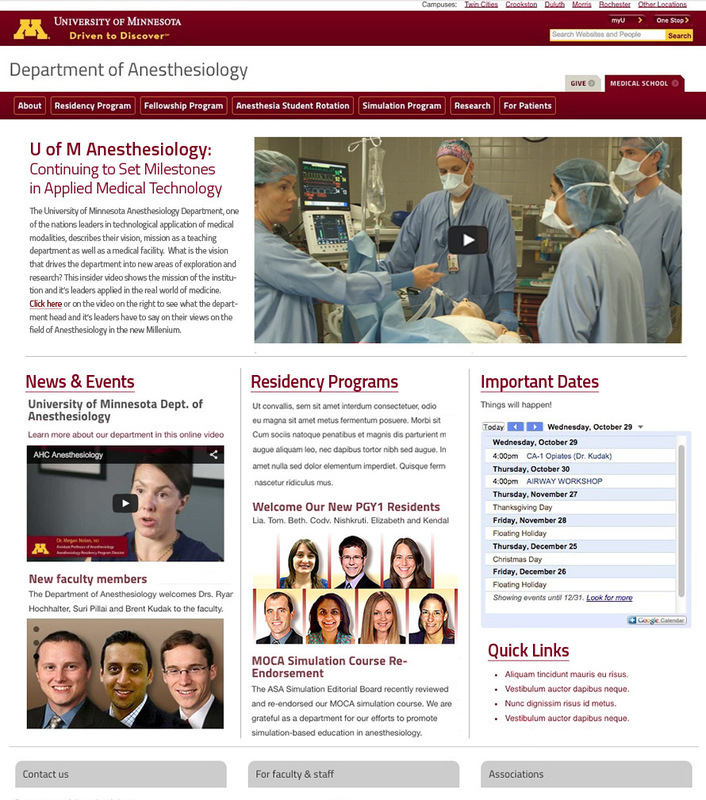 Homepage design for the new website for the U of M Anesthesiology Department. This design was selected Head of the Anesthesiology department over other concepts. Photo effects and graphic design aspects designed and created using Adobe Photoshop and Illustrator. 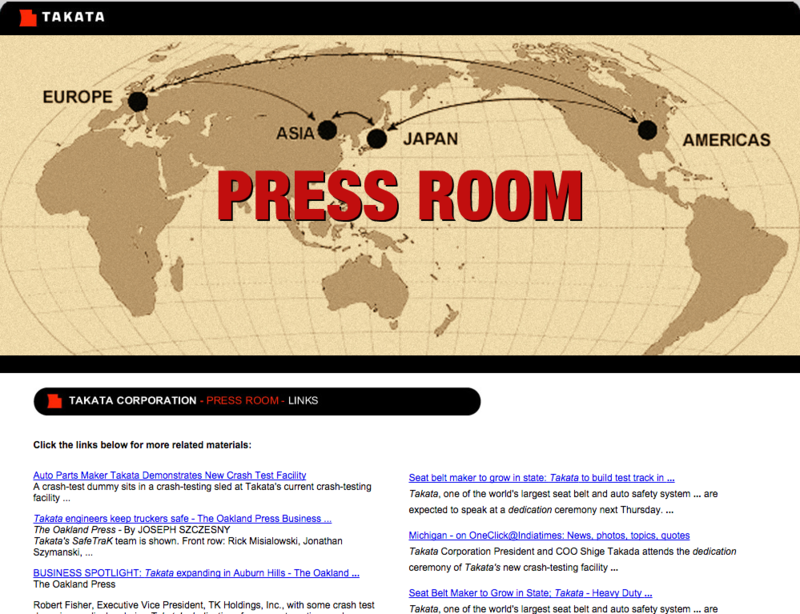 Website created with the Drupal CMS. 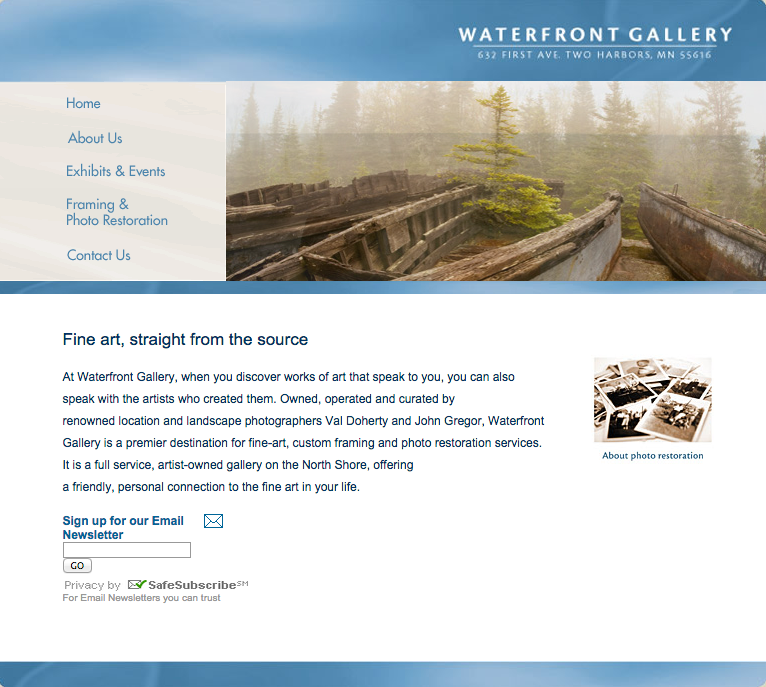 This website was created for Waterfront Gallery, Minnesota. The design attractively and subtly made it easy to see who the gallery was having as visiting artists, easily presented information on the gallery, hours of the operation, etc. Image effects and graphics designed and created using Adobe Photoshop and Illustrator. Website created with the Wordpress CMS. Website Design: Takata Safety Inc.
We designed this prototype site for the Takata Safety, USA, using Adobe Photoshop and Illustrator as design tools and Adobe Dreamweaver for the website design and development. 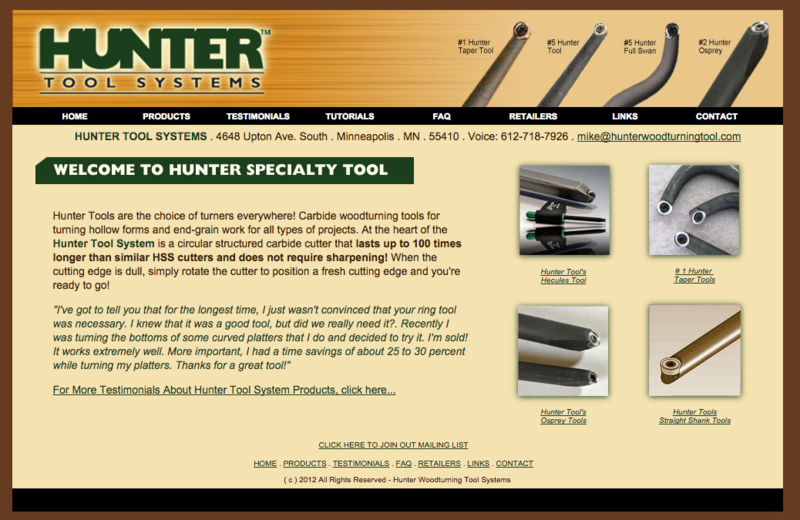 The new website we designed for Hunter Tool Systems replaced their previous website, showcasing their unique woodworking tools. The new design included a rebranding, new logo design and overall feel to the site that included an on-line product catalog and ordering. 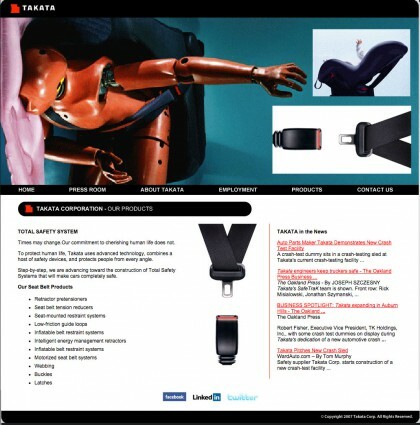 This was assembled with product listings and images and online "how to use the tool" digital video . 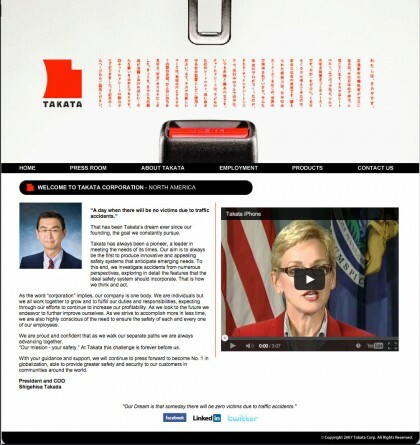 The website was created using Adobe Photoshop, Illustrator and Dreamweaver for website design and development. 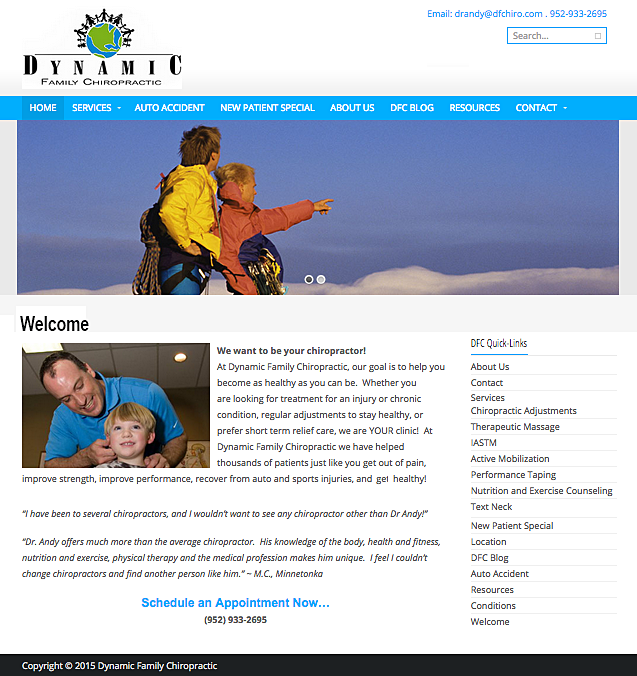 We designed Dynamic Family Chiropractics first website and the website redesign in 2015. 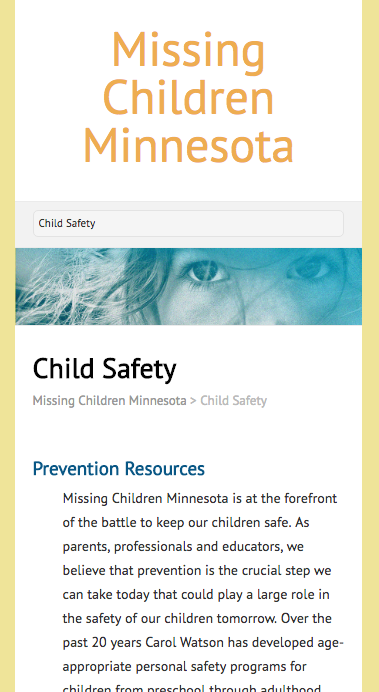 We redesigned the website so it was in the WordPress CMS format. This allowed others to perform simple page edits that don't require a website designer. The last images are from the previous website. All image effects and graphics were created using Adobe Photoshop and Illustrator. The initial website was created with Adobe Dreamweaver and the new website with the CMS Wordpress. 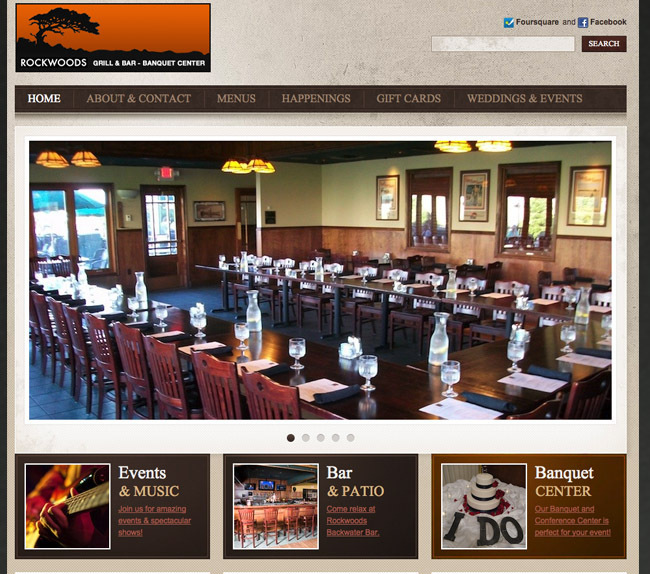 This website Design for Rockwoods Grill & Restaurant in Plymouth, Minnesota was created using Adobe Photoshop, Illustrator, Dreamweaver and Contribute. 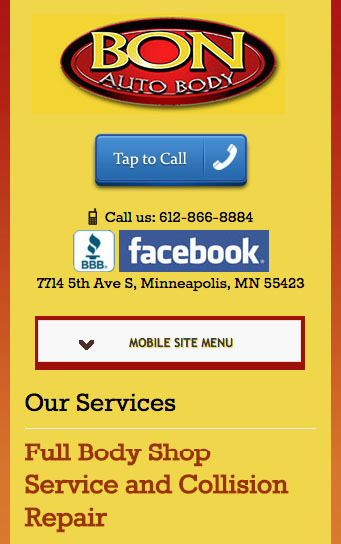 The landing page allows site visitors to select their location and view specific information on that restaurant, such as specials, live entertainment, location directions and phone, etc. 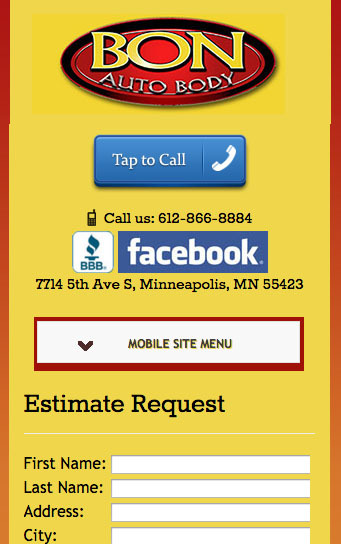 Other graphic features attract site visitors to wine lists, website address, email contacts, etc. 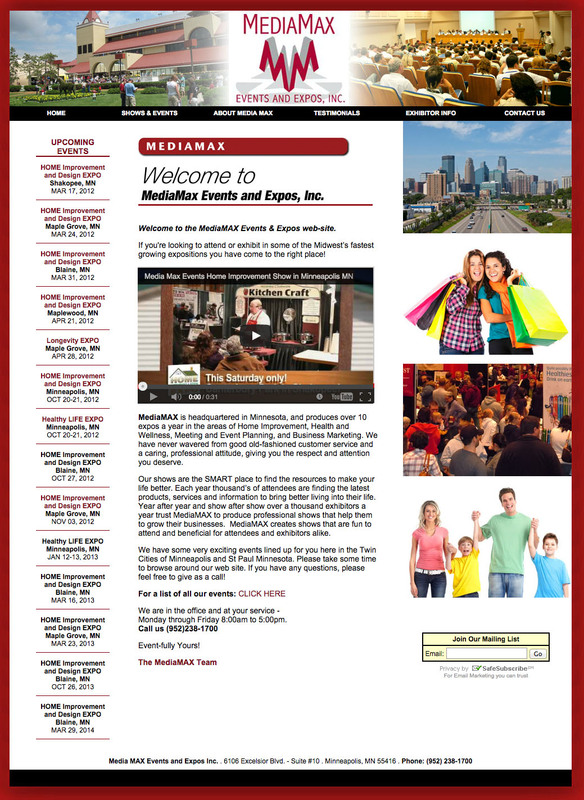 This website design was structured to present important information on MediaMax trade shows and highlight trade show dates, locations and times. The website also serves as a secondary marketing vehicle for show participants by listing them as event participants. The website was created using Adobe Photoshop, Illustrator and Dreamweaver for website design and development. This is the final art for a two page spread ad on the advantages of two different screeds (types of asphalt spreaders) used in conjunction with Caterpillar's road construction heavy equipment. The layout and final art were created using Adobe Photoshop & Illustrator. 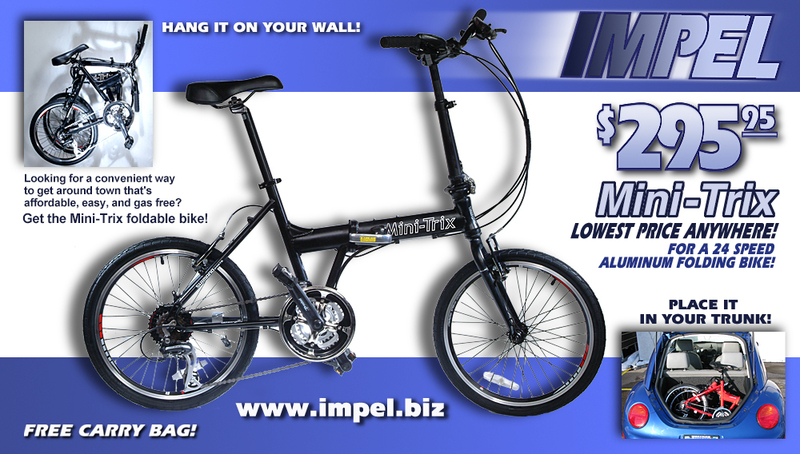 This is the design concept and final graphics for Impel Portable Bicycle. It was used in both print advertising and digital media. The initial concept pencil rough is shown, as well as the final artwork with image effects. This design, used both online and in print was created using Adobe Photoshop & Illustrator. Design of the visual Identity and brand design standards for Berkshire Home Solutions, a custom builder and contractor in Minnetonka, Minnesota. Final digital artwork was created using Adobe Illustrator. The visual identity and branding standards for LOGA were created for the Law Offices of Golub and Associates located in San Diego, CA. The powerful LOGA identity is used on all type of media: Signage, letterhead, business cards, wall graphics, doors and in digital media. Final digital artwork was created using Adobe Illustrator. Visual Identity and brand design for Gotham Specialty Construction of N.Y., N.Y. Based on the famous Unisphere sculpture from the 1964 New York World's Fair in New York The identity and brand standards are applied across collateral, promotional, and digital media. Final digital artwork was created using Adobe Illustrator. 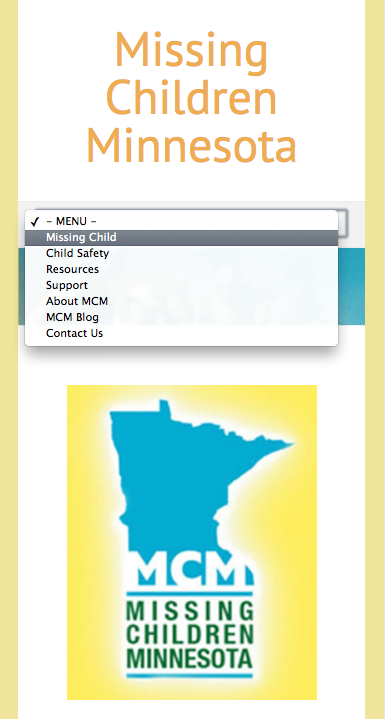 Created for Pine Valley Associates, a Minnesota based digital application development company. 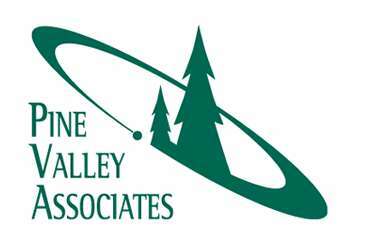 Pine Valley Associates and Tela Inc. have been respected Internet digital services providers for over twenty years. Final digital artwork was created using Adobe Illustrator. 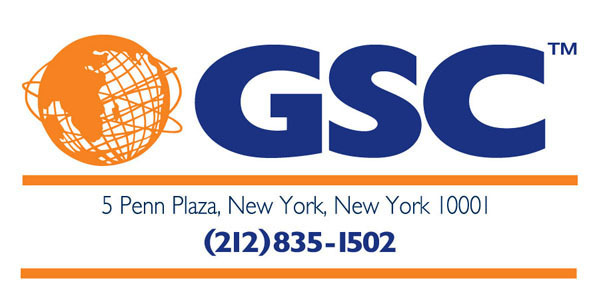 New Yorkers know the "Four Points" of so the company is quickly identified with N.Y. and it is also descriptive as the business has four service divisions, each services a one of the Four Points. The identity and brand are applied on everything from vehicle graphics, building signage to marketing materials and digital media. Final digital artwork was created using Adobe Illustrator. Visual Identity: Fitness For Your Business Inc. This identity was designed for Karin Rush and her company "Fitness 4 Your Business" a business consulting firm in the Twin Cities. F4YB specializes in helping businesses to become more profitable through efficient improved systems and practices. The identity and brand is used throughout it's media and communications materials. Final digital artwork was created using Adobe Illustrator. 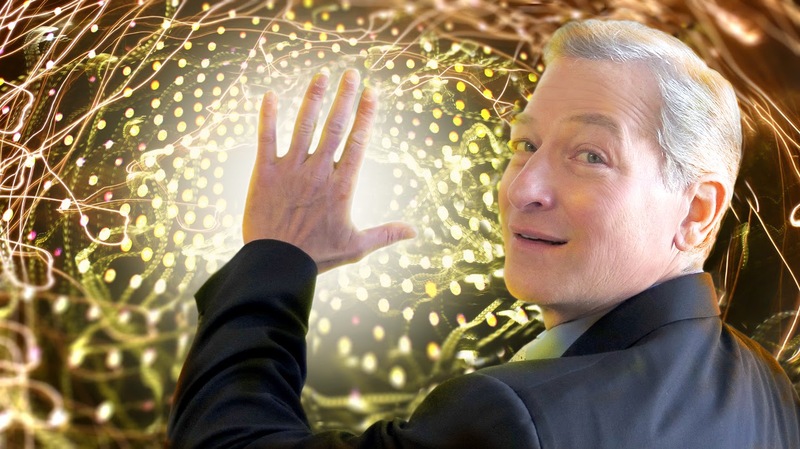 An image illustration created with Adobe Photoshop of anesthesiologist Dr. Tom Losasso, who specializes in molecular medicine and nanotechnology. It combines images of Dr. Losasso and manipulated, blended and distorted abstract images to reflect life at the microscopic level. This design created using Adobe Photoshop and Illustrator for a Chevy Volt promotional campaign is intended to reflect the look of prehistoric "B" movie posters. 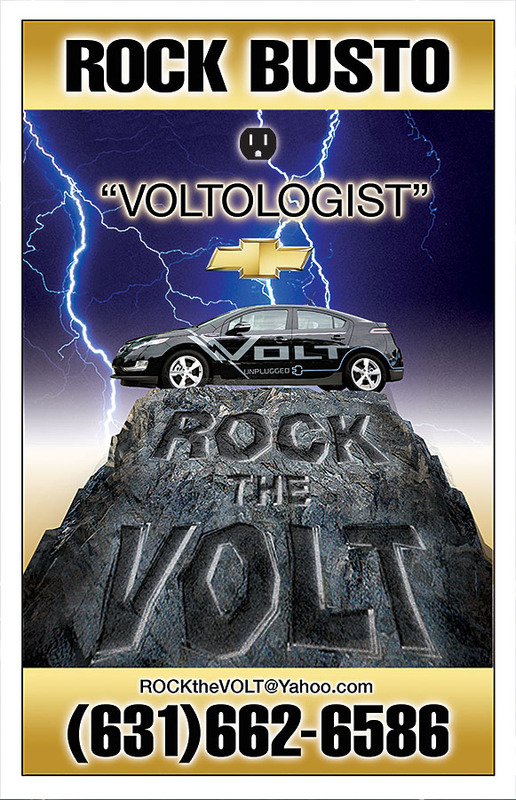 The final graphics were used for all type of promotional materials such as business cards, brochures and posters for the dealership of "Rocky" Busto, a Chevy Volt dealer in New York, New York. This image illustration that creates a dreamlike Illusion of a group conference was constructed using Adobe Photoshop and the collected digital photos taken by attendees at the event. Rather than a typical collage, the photos were recombined to resemble a conference, but with a dreamlike aspect to compensate for a lack of volume and quality. 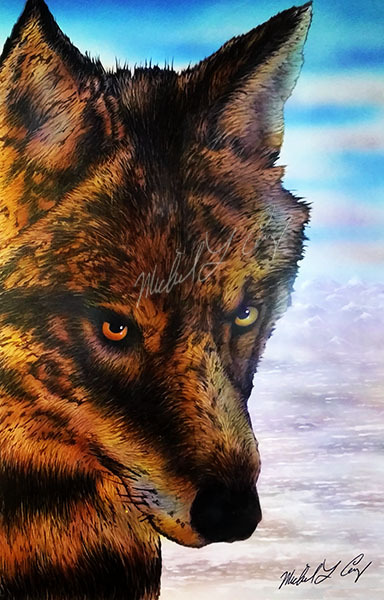 Airbrush illustration of a wolf in winter. Done as a commissioned painting. Framed as artwork, but could serve also serve as an illustration. Finished size is 18 x 26 inches on heavy duty, archival acid-free, cold press bristol board. The art itself is a combination of transparent acrylics and fine sable brush work in highly detailed areas. 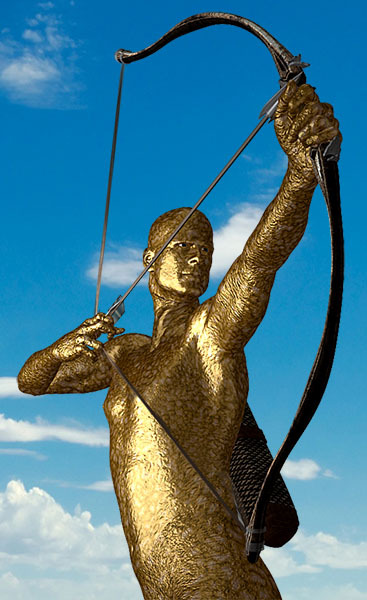 Illustration of a mythological golden archer. Concepts drawn as sketches and final artwork created using digital tools. 3D modeling software Poser and Adobe Photoshop combined to create the final artwork. 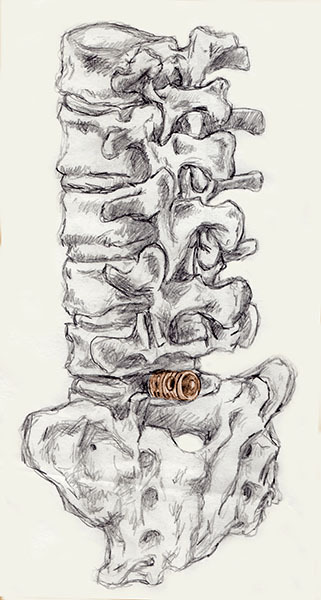 Initial sketch of spinal artwork illustration created for an art director designing a brochure on implanted spinal medical devices. This was refined and used for the cover of the product brochure for the end customer. This wall mural was created for a girl's bedroom. The goal was a soothing artwork, with bright color and the illusion of greater space. 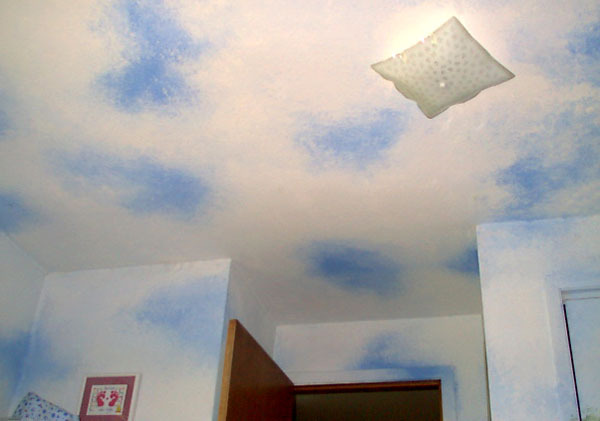 The artwork was on many multiple sized walls, closet and two entry doors and the room's ceiling. The art was designed to be the vantage point of a viewer looking out from the center of the scene. Illustration for a science fiction short story on the experience of a space traveller, who decides to raise his own genetically engineered plant species, to save the planet from planet wide starvation and become a hero! The short story is intended to be supported by three associated illustrations. Hand drawn art scanned and finalized in Adobe Photoshop. 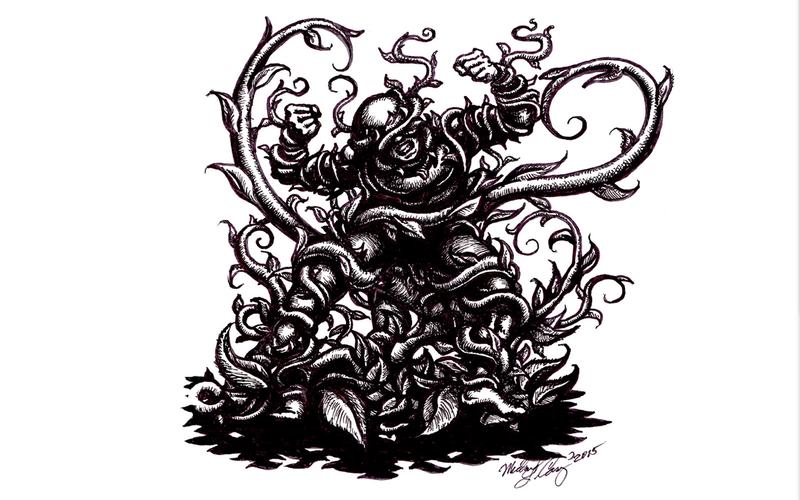 One of many pen and ink illustrations created for a children's book about a boy's secret life as a hero. 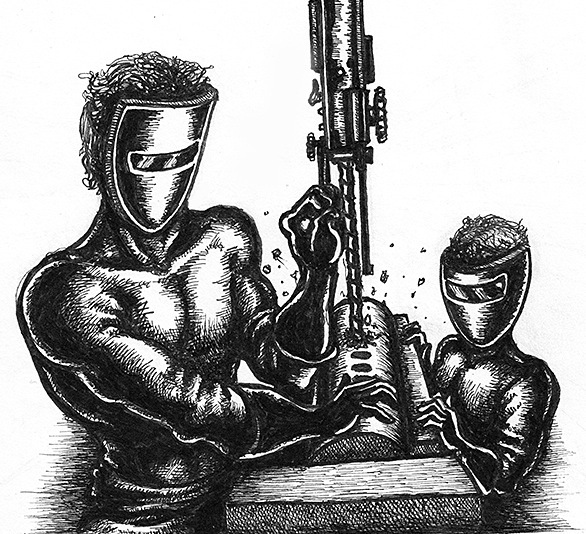 In this illustration the boy and his father are creating one of the many parts needed to help his son fight crime and defend the weak!! The publication is still in production, so for now, further information is limited. Graphics created for their logo and other materials created by Marx Metalwerk's, a custom motorcycle art and metal sculpture studio in Minnesota, specializing in art of individual's specific motorcycle, often them on it, created as a small metal sculpture. Original hand drawn art was scanned and recreated in Adobe Illustrator. This design was for the cover of the NBR Insurance Collective's Annual Report. The artwork was created entirely on a Wacom drawing tablet and edited in Adobe Photoshop. 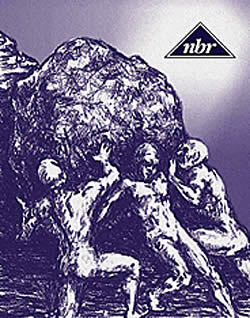 NBR is an insurance collective that support one another to offer greater services. The illustration stresses the power of teamwork. * All work shown is the property of Casey Digital Design and artist/designer/developer Michael L. Casey and is protected by United States copyright and trademark law. Mike Casey has given me a presence in marketing. 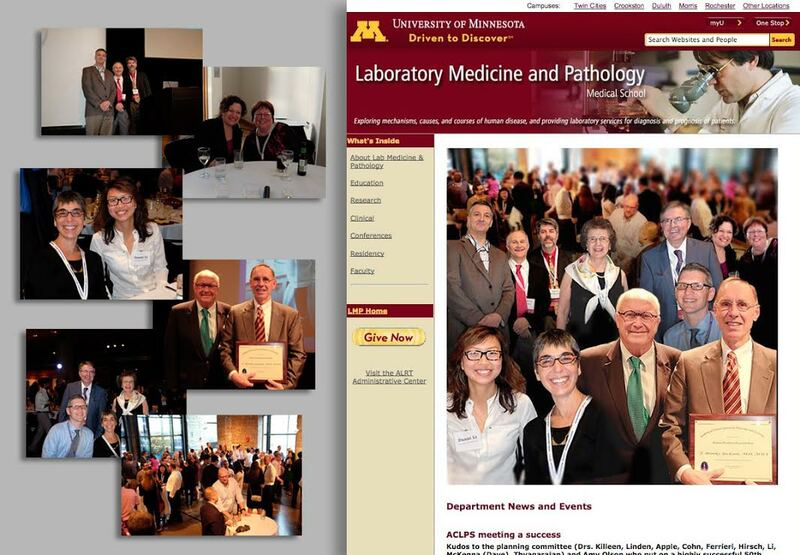 He was able to transform my old site into a functioning beautiful website which draws a lot of attention. He is fast, courteous, and efficient with every request. I defer to Mike with any website or graphic issue. I have know Mike personally and professionally for over ten years. In that time I have seen him create some of the most creative and sensible craftsmanship in the business of information technology. If I were to choose a partner in business, Michael Casey and Casey Digital Design would be one of my first choices. In the short period in which I have had to work with Michael Casey, I found him to be quite personable and professional. He approached his task efficiently and his management of time made the process quick and effortless. I would look forward to interacting with Mr. Casey in the future. I am sure that all others around him appreciate his personal and professional demeanor. I always know that Mike Casey is going to do an excellent job. He’s very accommodating; especially when it’s right down to the wire and we have changes. He makes the whole process run smoothly. I would highly recommend Mike to anyone needing design services! Mike Casey is an outstanding choice to assist any business owner develop their web site. 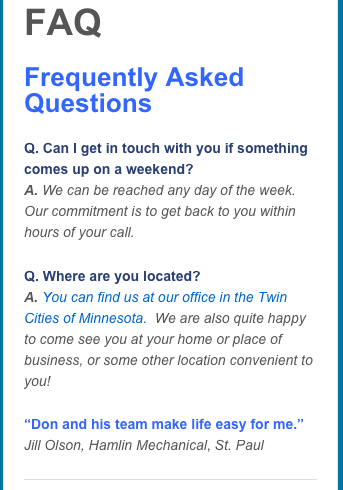 Mike takes the time to listen and understand the owner’s business, so that the web site will meet all objectives, including maximizing new business opportunities and providing superior customer service. Mike’s experience allows him to match proven technology with the business owner’s budget. It has been, and continues to be, my distinct pleasure working with Michael Casey and Casey Design Group. I have received excellent design ideas, very creative artwork, and consistent and professional web site support. I couldn’t recommend Michael more highly. I’m a customer of Michael Casey. He designed our logo and worked on other design and marketing projects. All the work was done on time and budget. We’re very happy with the quality of the work and service, both have been a “10”. Mike’s work on our logo was absolutely unbelievable! This was our 3rd attempt to get it right. We get many compliments on it and still use it today.” He is has strong creative and communication skills and an understanding of all aspects of running a business. I’m excited about working with Mike Casey of Casey Digital Design on my website. After interviewing me on what I wanted from my site, Mike hand-sketched three different front page ideas, which allowed me to have a visual reference and determine which features and elements I liked best. I’ve seen his finished work with other clients and know he will be able to capture the essence of my business and increase my marketing options. Thanks Mike! Mike has done a great job with my website. With his help, I’ve been able to take my site to the next level. Since he revamped it, it’s been easier to maintain and I’ve had many comments from customers about how nice it looks. The new artwork is fantastic. In my residual research since Mike has redone my site, I’ve had a significant increase in the effectiveness of my most popular search term. I’ve gone from the being on the 3rd and 4th pages of Google to consistently on the first search page.